Sarasota Fishing Guides & Fishing Charters since 1997. Top Notch Fishing is a bay, backcountry, and near shore fishing guide service for West Central Florida. We operate in Sarasota Bay, Tampa Bay and service the Longboat Key, Siesta Key, Anna Maria Island, Bradenton, St. Pete, Tampa and Venice areas. Light tackle fishing for all of Florida’s game fish is our specialty. We have a trip that is right for you, your family, or your corporate event. Our trips range from bay fishing for snook, trout, and redfish to beach tarpon trips and offshore for grouper, snapper and more. This father and son team will guide you through the mangrove islands and white sand beaches to the crystal clear fishing waters of West Central Florida. These waters are home to some of the worlds most sought after game fish including giant tarpon and snook as well as a wide variety of wildlife. A trip to the coast of Florida is not complete without an adventure into the backwaters and onto the beaches that Top Notch Fishing calls home. The Top Notch web site includes all the information you need, from the types of trips we offer to the custom boats we use. The monthly fishing reports give you in-sight on what is being caught including pictures and fun stories. The captains page introduces both Capt. Tom Jr. and Capt. 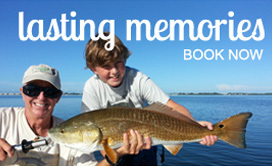 Tom Sr. and the booking page has information on the trips we offer and pricing. Pick up locations and directions are also on the booking page along with all contact information.